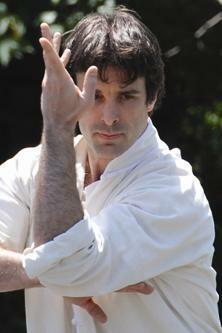 Raymond Ahles has been training in the Chinese martial arts since 1984 and teaching since 1986. He is committed to the authentic teaching of the martial arts so his students get far more from the experience than just exercise and self defense lessons. Shifu Ahles sees it as a path to a spiritual awakening of the mind with meditation as the foundation of the practice. He first studied with Shifu Randy Elia of Peter Kwok’s Kung Fu Academy in New Jersey where he completed all material available in the styles of Shaolin Chang Quan (Long Fist), Tai Ji Quan (Tai Chi), Ba Gua Zhang, Xing Yi Quan and Chin Na, the art of “seizing and controlling”. He received Bachelor of Science Degree in Exercise Physiology with a concentration in Adult Fitness at Montclair State University in 1988. Raymond Ahles has studied privately with well-known martial arts author and master, Dr. Yang Jwing-Ming of Boston, MA and in regular classes at YMAA, Boston, MA. He has trained in the study of the Jian (Straight Double-Edge Sword), Shaolin Long Fist, Shaolin White Crane, White Crane Staff, Chin Na, Tai Chi including Push Hands and Ba Gua Zhang. It was also with Dr. Yang that Shifu Ahles was first exposed to the basics of general Chinese healing massage, “anmo“. Dr. Yang was instrumental in forming the perspective that Shifu Ahles has of the martial arts today and was a great early influence to his practice. From Dr. Yang he learned the only way to become accomplished at anything was through patience, perseverance, and a strong will. Since 1991, Shifu Raymond Ahles has had the great fortune to be studying under the personal instruction of acclaimed Ba Gua Zhang (Pa Kua Chang) Master, Bok-Nam Park, of VA., with whom he was accepted as as a “Lineage Disciple.” He is an active member of the Ch’iang Shan Pa Kua Chang Association and a certified instructor in Ba Gua Zhang Kung Fu & Qi Gong. He is the owner and Chief Instructor at The Blue Dragon School of Martial Arts, formerly known as Bergen Kung Fu Academy, located in Bergenfield, NJ since 1993. As a traditional progression of kung fu, Raymond Ahles also has been professionally trained and certified in Oriental Medicine. While studying at the New York College for Wholistic Health and Medicine in Syosset, NY: he completed the Advanced Amma Therapy® (Chinese medical massage) program in 1997 and is a “Certified Amma Therapist” (C.A.T. ); and the Oriental Medicine program (Traditional Chinese Medicine, including acupuncture and herbology) in 1998. He is National Board Certified in Acupuncture and Chinese Herbs (NCCAOM) as well as a Licensed Acupuncturist (L.Ac.) in the State of New Jersey. He continues to study and teach his unique approach to the martial arts as a complete and whole practice referred to as BodyMind Training to students in the NJ area. Raymond Ahles is skilled speaker, writer and presenter. He provides meditation classes that include a 45 minute talk at The Blue Dragon School on Thursday. He provides these classes free of charge and opens them up to the public in an effort to encourage people to learn about and embrace the mental side of the practice. These lectures are available online at www.BodyMindAwakening.com. When his schedule allows, Shifu Ahles will occasionally give presentations or lectures at outside speaking engagements. Should you wish to have Shifu Raymond Ahles speak at your event you may contact the school at 201-385-3130.